Is Your Insecurity Causing You to Sin? Today, I’m happy to have a guest post for you all from one of my favorite gentleman in the blogosphere, Darrell Vesterfelt. Darrell has appeared on Modern Reject before and I’m so excited to have him back. Enjoy. I’m really insecure about my weight. I have been my whole life. There are all kinds of reasons for that. I used to get teased in high school, to start — words so insulting I can’t even list them here. I don’t have the fastest metabolism, to make matters worse. I have a difficult time staying at a “healthy” weight for my height. The hardest part isn’t that I feel like I’m fat, although that’s difficult in and of itself. The hardest part is the way that people look at, and talk about, other people who are in my position. I’m not ignorant to it. I’ve thought the same things you think. Fat people get in the way. I’ve spent my whole life, and a lot of my energy, trying to prove that these things aren’t true about me. You know what I’m talking about. You’ve done it too. The lies of insecurity run so deep that they have the ability to control our entire reality. If we aren’t careful, insecurity starts to dictate everything we think and do. How does it do that? What is it that makes insecurity so powerful? Insecurity lies to me about who I am. Insecurity lies in the scariest way that something can lie. It takes the truth and it twists it until it isn’t true anymore. Do you realize that? Insecurity can take two different realities and bring them to the same wrong conclusion. A woman who is a size 2 and a woman who is a size 12 both share the same insecurity: I’m fat. It makes them both act in irrational ways. The first woman hears, “You’re fat. No matter what you do, you’ll never be good enough,” so she tries and tries to disprove her insecurity. She’ll avoid eating all day if she has to — until she has nearly starved herself to death. The second woman hears, “You’re fat. No matter what you do, you’ll never be good enough,” so she gives up trying altogether, pretending it doesn’t matter to her anyway — binging, in private, to numb her pain. Two different realities. 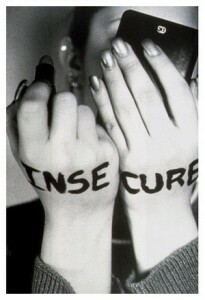 Same insecurity. That’s how you know insecurity is lying. Insecurity screams louder than reality. The danger of insecurity isn’t just that it lies, it’s that it lies really loudly. Sometimes it seems like the lies of your insecurity are speaking louder than reality. My insecurity doesn’t just tell me that I’m overweight, it tells me that there’s nothing that I can do about it, that I don’t have what it takes to change, and that the way I look dictates my value. None of these things are true — but it’s amazing how easy it is to believe them. It’s so easy to believe them, in fact, that it covers up what is true, which is that although I am overweight, I do have the power to change to the way I eat and the way I live, but that even if I don’t ever lose weight, I’m not lazy, ugly, or stupid. My weight does not dictate my value. When we let our insecurity speak to our value, we are not just believing a lie, we are worshiping that lie, by responding to it and living in it as if it were true, rather than choosing to live in reality of Jesus. Insecurity begs us to protect ourselves, which is never helpful or constructive. Maybe the worst part about insecurity is what it tells us to do, which is to protect ourselves from everyone and everything. Protection costs something, and nearly every time I try protecting myself it is at the expense of someone else. Nearly every time it takes its dividends from my relationships. My insecurity tells me to act tougher than I am. I bet your insecurity tells you to do similar things. We have insecurity, in part at least, because we were wronged. For me it was what kids said about me when I was in school, and the way they treated me. Maybe for you it was your relationship with a parent, or a boyfriend or girlfriend. It’s a natural human response to respond to pain with protection. But I have good news for you. You don’t have to choose a natural human response anymore. You have Jesus. Ask him for the power to respond to your insecurity. Insecurity has no power over you. Did you know that? Your insecurity might seem strong. It might seem so strong that you think you can’t overcome it. These behaviors might feel so powerful that you don’t think you can stop doing them. You might out-spend your budget on clothes each month, or obsess over what you’re wearing before you leave the house. As for me, I am changing. I refuse to allow the lie insecurity has been telling me my whole life to dictate my future. What has made you feel insecure? What have you struggled to overcome in a particular area? How has God brought freedom to you? Darrell is the president of Prodigal Magazine and church planter in West Palm Beach, Florida who believes in the power of stories to change the world. His life’s passion is to help people by tell their story so they can see and understand the truth of God at work in their lives. Thanks Alece — It is truth that I have to remind myself of on a daily basis. I am convinced that the security that we can find in our relationship to Christ changes the world. I love Modern Reject and read it all the top. I enjoyed this article until you compared the two women. A size 2 and a size 12. “Two different realities, same insecurity.” After that I stopped reading, because I am a size twelve and have the same insecurity as Darrell. I would have just left that part out, being that I’m sure I’m not the only person with this insecurity who may be reading this article. I’m really sorry you did not like that part of the article. I wish you would have kept reading, because the article continues to tell about how I find truth above what my insecurity is telling me. Again no offense to anyone was intended, as I am overweight and deal with this insecurity on a regular basis… I understand. I’m a size 14 and would encourage you to finish the article because the statement actually had a very awesome relevant point to insecurity…not to size. I promise! Darrell- thank you for writing an amazing, heartfelt story. My weight has been an issue for so long I was not even sure how to start dealing with it…I kept asking God to help me fix my weight, make me love exercise, love veggies instead of cookies, etc. But your story hit home…”Ask him for the power to respond to your insecurity” It is about overcoming the insecurity NOT THE WEIGHT! wow. major revelation for me. Thank you! wow. this is beautiful. it’s saddening how we obsess over ridiculous things that ultimately do not add any worth to who we are, eventually letting it destroy us. i am so thankful for this post, and others like it, that expose the lies that we accept and motivate us, through the truth and grace of Christ, to actually get up and do something. such a timely post. thank you. I am glad it was something that resonated with you Megan. Wow, seven years walking with Jesus & I never thought insecurity was an issue for me, as I’ve always seemed to err on the side of being too proud & judgmental. But God really used this to convict me of using those as defense mechanisms due to my fear of rejection. Thanks so much for sharing this truth. Julia — that is so powerful. I am glad that you came to that realization today. Julia, so awesome…not that you were convicted, but that God spoek to you through Darrell’s post. I love that and I love that ur God will use so many different means to reach our hearts because of His great love for us. The part about clothes and hooking up rang true for me in my past and I have yet to really forgive myself for this. The shame and regret keeps me living in fear of becoming that person again. I feel paralyzed!